This beautiful, most nocturnal of all the big cats is probably tourism's major star, but is also the most elusive. Males being larger than females by up to 30%, can weigh up to 65 kg and females up to 58 kg (Estes 1992). They spend most of the daylight hours resting in trees; they can be completely camouflaged by their markings. Their coloration is varying shades of tan with black spots grouped in rosettes on the body and upper limbs. Sturdy and solid in build with short but strong limbs and neck enables them to carry up to twice their own body weight. 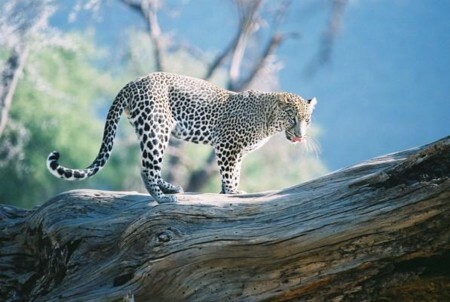 The habitat of the leopard is mostly areas with a reasonable amount of cover, supply of prey animals, from forested areas to savannah and barren deserts. They share this habitat with other predators such as lion, cheetah, hyena and jackals. Being mostly nocturnal in habit they have supreme night vision, acute hearing, whiskers that act as sensors when hunting after dark and are the masters of silent movement through the undergrowth. They are scavengers as well as hunters, will, when given the opportunity, steel the kills of other predators and will eat almost anything. This adaptability in diet is the main reason for their success. 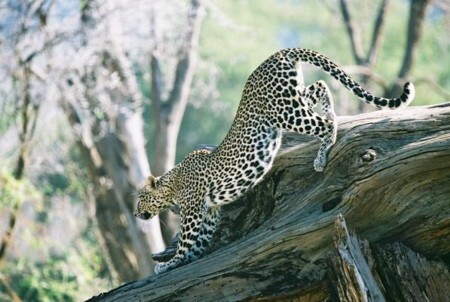 Leopards will drink when water is available, but can get sufficient moisture from the blood of their prey. Longevity in the wild can be up to 14 years. Being solitary in behavior, males and females only spend time together for mating. The gestation period is 90 - 105 days, producing a litter of usually between 1 and 3 cubs, but cub mortality is high as they are frequently killed by other predators. At birth cubs weigh in at around 400 - 600g and are born concealed in dense thickets, caves or hollow trees. The family of mother and cubs will stay together until the cubs are 18 - 20 months old, when the mother will encourage them to leave, spending less and less time with them. At this point the female will come into estrus and seek a male with which to mate. 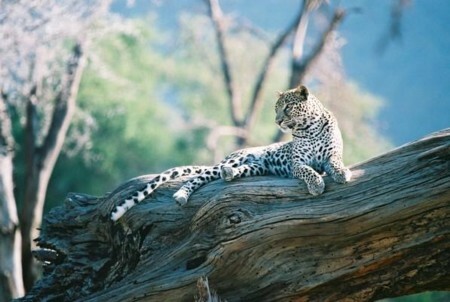 Solitary, secretive and aloof the leopard is an excellent predator. Mostly hunting at night, the master of concealment, stalks to within 2 meters of the prey, before making a short, fast rush; capable of short burst speeds of up to 37mph. Approaching from downwind, so as not to alert the prey to their presence. The kill is a single bite with their 4 long canine teeth and powerful jaws to the back of the neck or as with larger prey, a suffocating throat bite. Contrary to popular belief, a leopard does not always conceal prey up trees, but will drag a victim several meters into thick vegetation to hide and eat when other predators are not around. 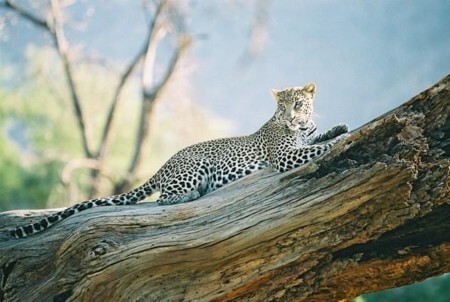 Kill remains can be seen up in trees, taken there by the leopard if a kill occurs when other predators are near, as kills may be lost to lions or hyenas. 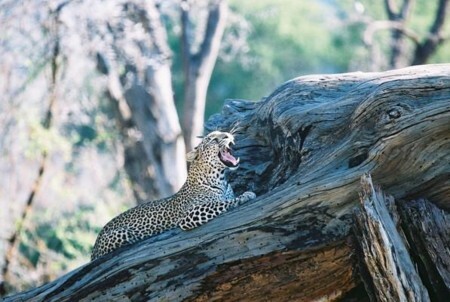 Leopards usually eat in the same way, by licking fur from the belly till it is bare. Their tongue is covered in tiny hair-like structures. The belly is then torn open with the sharp, strong claws. The guts are removed and covered with grass and dirt, but muscle tissue, liver, kidneys, heart, tongue and eyes are consumed, along with a certain amount of skin and hair. When an adult female has eaten she will let her cubs feed. Return visits are made over several days if the kill cannot be consumed in one sitting. References: Adamson 1969, Bertram 1974, Estes 1992, Schaller 1972.